RT – March 26, 2018: Vienna chose not to expel Russian diplomats as a response to the poisoning of double agent Sergei Skripal, saying it wants to keep dialogue with Moscow open. Some European opposition figures say the move will only create problems. Speaking to Sputnik following the announcements by various EU and other European countries, Austrian government spokesman Peter Launsky-Tieffenthal said that Vienna “will not take any measures at the national level, we will not expel diplomats. “I am looking now, that the Foreign Minister of Germany [Heiko Maas] is talking about the decision as a sign of solidarity – this decision on the part of Germany to send out four diplomats. This is of course, in my opinion, you have to very critically look at this. In this regard, the decision should not be taken because of some sort of solidarity. Whatever problems or errors there may have been, the position of Germany should not have been built upon solidarity,” Maurer said. Maurer went on to note that Russia would respond with the expulsion of diplomats from all of those countries, adding that such moves will not lead to a normalization of ties. “We all know that Russia is obliged to reply to the expulsion of its diplomats. I am certain that German diplomats, which are now in Russia, will also be expelled from the country. We know that this always happens. This will not lead to solving the problem,” he said. LMT ONLINE – June 28, 2018: Sebastian Kurz was a member of the Austrian Cabinet. By 27, he was his country’s foreign minister. And by 31, the debonair university dropout with the slicked-back mane and the Hollywood grin became the world’s youngest leader. In the next few weeks alone, he is trying to seal off Europe from asylum seekers arriving by sea, orchestrate a summit between President Donald Trump and Russian President Vladimir Putin and, critics say, undermine Germany’s Angela Merkel, the most consequential European leader of the past decade. The 63-year-old, four-term Merkel could see her government collapse as soon as this weekend. If it does, she will have mutinous members of her own conservative bloc to blame. But equally important will be the role of Kurz, who has repeatedly appeared in public with the German rebels to bolster their zero-tolerance immigration stance and not so subtly take aim at his fellow chancellor. SPUTNIKNEWS – March 28, 2018: Austria is prepared, if asked, to act as a broker between Russia and the West in the spat over the Salisbury attack, the nation’s Foreign Minister Karin Kneissl said Wednesday. Kneissl, whose country did not follow UK’s lead, said in a show on Austria’s ORF television channel it was important to keep channels for dialogue open. SPUTNIKNEWS – April 5, 2018: The chancellor emphasized the neutral role of the country on the international scene, commenting on the reasons why Austria and the third of the EU states refused to take part in the expulsion parade, induced by the UK over allegations that Russia poisoned ex-spy Sergei Skripal. Austrian Chancellor Sebastian Kurz named several reasons for Vienna’s decision not to expel Russian diplomats at London’s behest amid the controversial Skripal case. “We have good relations with Russia now. We are a neutral country and home to the headquarters of many international organizations such as the UN and OSCE; hundreds of diplomats come here to have talks on neutral ground. That’s why we can develop the role of a bridge between nations,” said Kurz. “One is asked to mediate. But we are a go-to partner for all those involved,” she said. 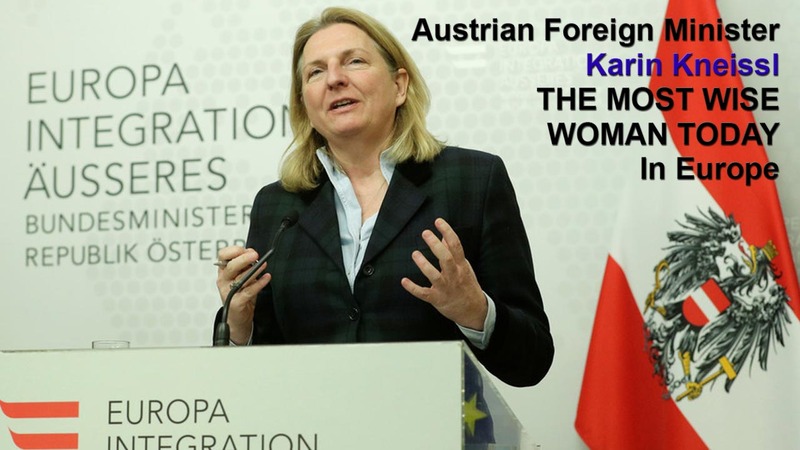 TASS – March 28, 2018: The UK Ambassador to Austria has repeatedly voiced his country’s official displeasure at Vienna’s refusal to expel Russian diplomats over the Skripal saga, Austrian Foreign Minister Karin Kneissl said, according to the Austria Press Agency. The Austrian top diplomat confirmed that the British ambassador had started expressing disapproval ahead of the European Union’s summit last Wednesday “to force us to take certain measures,” and he reiterated his call on Saturday. On Monday, the Austrian foreign minister and the Chancellor announced that Vienna would not kick out Russian diplomats. According to the minister, Vienna’s refusal to expel Russian diplomats is not linked to possible Moscow’s countermeasures. Austria’s decision showed a principled position, which very rarely uses the tool of expelling diplomats, she said. “Especially during critical moments, channels should remain open,” Kneissl stressed, noting that the US move to sever ties with Iran in 1980 did not yield any good result. “It hurts both sides,” she stressed. SPUTNIKNEWS – March 27, 2018: However, 12 EU member states, namely, Austria, Belgium, Bulgaria, Cyprus, Greece, Ireland, Switzerland, Luxembourg, Malta, Portugal, Slovakia and Slovenia, have not demonstrated “solidarity” with London and refused to boot out Russian envoys.